Written by Catherine Saxelby on Wednesday, 04 March 2015. Or I cooked Green Eggs with Ham p 87 Or Eggy Muffins p 92. In short, nothing sweet is allowed. This is designed intentionally for the first six weeks of this IQS program to “re-calibrate your sweet tooth” to a new set point according to author Sarah Wilson. By then, hopefully, you will find normal food tastes way too sweet and unpleasant and this makes cutting back effortless. If you like dessert or baking or always like to finish off a meal with something sweet, then this diet is NOT for you as it would be too restrictive, though Sarah would probably argue that you are exactly the sort of person who should be on the diet. Diet drinks and diet desserts sweetened with aspartame or acesulphame-K are also not allowed. After six weeks, you can gradually introduce one or two pieces of fruit a day or select foods with no more than 3-6 grams of sugars per 100g which doesn’t allow you much really e.g. a lime sports water or coconut water has around 4-5g per 100mL. Don’t figure on a vanilla yoghurt or a lemon mineral water – they’re too high. In the last two weeks and beyond, you are allowed to make all sorts of desserts sweetened with rice malt syrup or glucose (dextrose) powder or glucose syrup e.g. Karo, sweeteners that have the same kilojoules but are based on glucose, not fructose. I found these sweet concoctions difficult to understand. They were rich things that use coconut fat or desiccated coconut as their fat and were sweetened with the above or a mixture of stevia with xylitol. Sugar, whether brown, raw or molasses, must never pass your lips. The fructose it contains will immediately go to your liver and then poison all your body cells, says Sarah. “Moderation is nigh on impossible with sugar. It’s all or well, nothing.” according to Sarah. Hmm… So why can you add it in again in small amounts after 8 weeks? The IQS diet wasn’t a huge struggle as I don’t consume much sugar in the first place e.g. I don’t drink sweetened fizzy drinks and am wary of the many juices/smoothies/shakes now so trendy at juice outlets and drink aisles (remember a warning nutritionists have been saying for years now: “Don’t DRINK in the calories”). I’m not a lover of chocolate but don’t mind a square now and then. 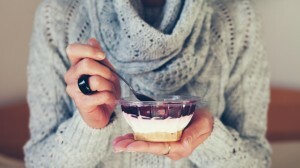 As I’ve gotten older, I’ve noticed my sweet tooth has waned and I’ve become more of a savoury eater and I now enjoy bitter-tasting foods that I would have turned down before e.g. radicchio, grapefruit, endive. Desserts or biscuits aren’t something I have at the end of a meal. However, I did miss my fresh and dried fruits. is big on coconut fat for everything from greasing baking trays to chocolate nut butter cups. Cutting out sugar removes a whole category of junk food. Think about it for a moment. It’s not just the sugar you put in your tea or coffee that’s going. It’s the doughnut, muffin, choc chip cookie, lollie, chocolate bar, friand, thick shake or ice-cream that’s suddenly not permitted, whether low fat or not. Yes you’re removing sugar but along with it you’re removing a heck of a lot of fat and refined starch. Not to mention undesirable colours and preservatives and those soft drinks, cordials, sports drinks, iced teas and various smoothies as well as sweet alcoholic drinks or cocktails with their juices and syrups. I could still eat some junk whilst avoiding sugar entirely by eating potato crisps, corn chips and similar salty snacks (the plain types, not the flavoured ones that often have sugar). Ditto for the vast cheese platters that I see going down with drinks or at a dinner party. I sipped a glass of red wine on three days whilst on the IQS week. Alcohol is a huge problem for many dieters and is responsible for much of the excess intake at the moment, not to mention the greasy fries or pizza swallowed whilst having one too many drinks. The less you have, the easier the weight loss will be. Did I lose weight over my week? Yes my waistband was definitely looser and I felt lighter after my week. I don’t weigh myself these days (after years of obsessive scales watching) and much prefer to ‘feel the difference’ in my clothes. It wasn’t as hard as many diets I’ve embarked on or the 5:2 Diet which stretches out over the day with NO food allowed at all which I found a struggle. Nor is it as painful as the many popular juice detox diets around at the moment. Did it recalibrate my sweet tooth? Yes, I definitely found it recalibrated my ‘sweet tooth’. I didn’t crave any chocolate or sugar-sweetened foods and found I actually developed a more savoury man-style palate in me which was due to the protein-rich meals of meat, fish, chicken with three veges and the small serves of grains – hearty and filling so I didn’t get hungry after dinner. It was a healthy, albeit a little obsessive, approach to weight loss and eliminated most of the junk food in modern diets but it’s not for me in its current form. I missed my fresh fruit after dinner and between-meals and over my morning muesli ( I love my own muesli topped with yoghurt and diced fruit). I also would miss the prunes or dates I enjoy from time to time – not a huge thing but something I like and look forward to. If I were to adopt it long term, I’d tweak it a bit by adding in a few of these items and making sure I get more outdoor exercise which is not stressed very much in the book. Still, on the plus side, it’s a good starting point for those who can’t exercise much or who want to de-junk their diet – the IQS book eliminates pretty well all junk food which is a step in the right direction.